1) Mix all ingredients except fish . 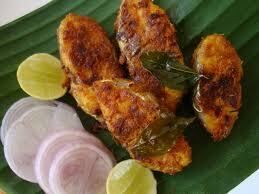 2) Apply the masala to fish pieces and keep a side for 10 mins. 3) Now take non-stick, flat pan add 1 tb spoon oil and put 4 pieces of fish . 4) Fry both sides on very slow flame. 5) Repeat the same process and finally sprinkle lemon juice and coriander leaves.